3 illustrated stories and a text piece in this hefty one shot. Let's break it on down. . . 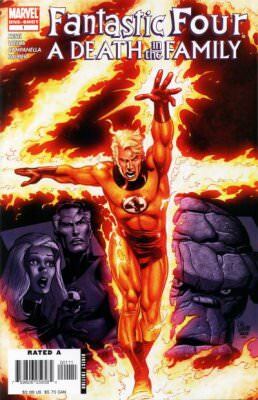 When The Invisible Woman is accidentally killed, her brother (The Human Torch Johnny Storm) travels back in time one hour in order to save her. Overall, not a bad story at all. It's basically a shortened superhero version of "Groundhog Day", where even though he makes changes, things still manage to turn out about the same until he's finally able to save his sister with the help of his past self. What I liked most about this story was the sad twist at the end where it's revealed that he knows that nothing will have changed in his OWN time. He just wanted to save Sue and create a timeline where she was still alive. The art was a bit blocky and workmanlike, but it did the job. All in all, a good little story. After a humiliating T.V. interview where the Invisible Girl is called out as being a damsel in distress fifth wheel on the team, she finds herself in the position of single-handedly saving them all when their infant son somehow manages to grow into an ultra-powerful adult with the mind of a child. I'm not sure WHY this reprint was included, but beyond the great John Byrne artwork, it's pretty bad. The dialogue is decent, but serves a laughable plot that tries a bit TOO hard to show the Invisible Girl's place on the Fantastic Four. It comes off as forced and a bit sappy, then defeats its own purpose as the story becomes all about The Thing at the end. Good for a bit of 80's nostalgia, but not much else. A short story about Franklin Richards getting into mischief with an invisibility ray while trying to peek into some birthday presents. There's not much to this story. It's sort of charming, and the art has a very cartoony look to it that sells the light tone, but to tell the truth it seems a bit out of place. This all-text piece looks like it might be from one of the Marvel guides to their universe. It's densely-written and pretty detailed, but the black letters on a blue background make it practically unreadable. Overall, this one shot seemed pretty unfocused and all over the place. I'm not even sure why it even exists or what the thinking was for deciding on the other material in it along with the main story. I guess Marvel didn't feel that the main story alone could justify the extra price they wanted to charge, so they just threw in some random stuff to pad it out. While on a secret mission with Nick Fury and His Howling Commandos during WWII, Bucky Barnes is wounded and ends up falling in love with the daughter of a resistance fighter. In the Meantime, Captain America and The Howlers disrupt The Red Skull's nefarious scheme by way of massive explosions and punching a giant robot! First off, I have to give good points for that excellent cover! I wouldn't mind a poster of that one. The art throughout is also nicely done. There's two artists switching off, but they share a similar style (it reminds me of Darwyn Cooke, and there's nothing wrong with that) so you can hardly tell. As for the story, it seems a bit. . .light. . .for what is touted as an anniversary special. It's basically Cap and The Howlers putting a stop to yet ANOTHER Red Skull scheme involving a giant robot while Bucky recuperates from a wound and falls for a girl. That's not to say it's a BAD story at all. It's actually pretty good, in a well-worn sort of way. It's just not what I'd think of being worth an extra-priced "Anniversary Special" treatment. 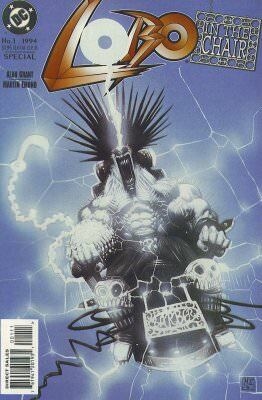 When Lobo is captured and humiliated by The Winter Brothers, things don't end well when The Main Man finally escapes. The story here is basically a bare-bones excuse for a one shot full of great art in the service of hilarious sight gags. Martin Emond knocks it out of the park with his exaggerated art style. Some of the jokes fall a little flat or seem to be trying too hard, but overall, this is definitely one of the best Lobo one shots I've seen. The panel of Lobo with a gigantic 70's afro is almost worth the cover price alone. Following Darkseid's imprisonment, civil war rages across Apokolips. . .
For a comic named "Darkseid" and with a picture of Darkseid on the cover, there's remarkably little Darkseid in this one shot. 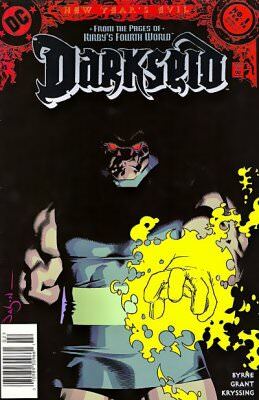 Instead, what you get is civil war in Darkseid's absence between the forces of Granny Goodness and Desaad vs. Virman Vundabar with a little Darkseid at the end when he animates a statue of himself and tells everyone to stop fighting among themselves and work together to destroy New Genesis. Honestly, if you're not a fan of Kirby's "Fourth World", you're not going to like this very much. I'm not a fan of Kirby's Fourth World. This one shot very much feels like you are stepping into the middle of a complicated ongoing story where everyone and everything has the most stupid name possible. If you're a fan of Kirby's Fourth World saga, you might get more mileage than I did from this one, but if you're not a fan I'd definitely suggest skipping this mess. Harley Quinn is invited by a mysterious message to become psychiatrist to supervillains, but it turns out in the end to be a plot by Amanda Waller to get Harley into custody and part of her Suicide Squad. First off, the title is a bit misleading. The Suicide Squad (or at least 3 members of it, not including Waller) appear only in one panel on the last page of the book. 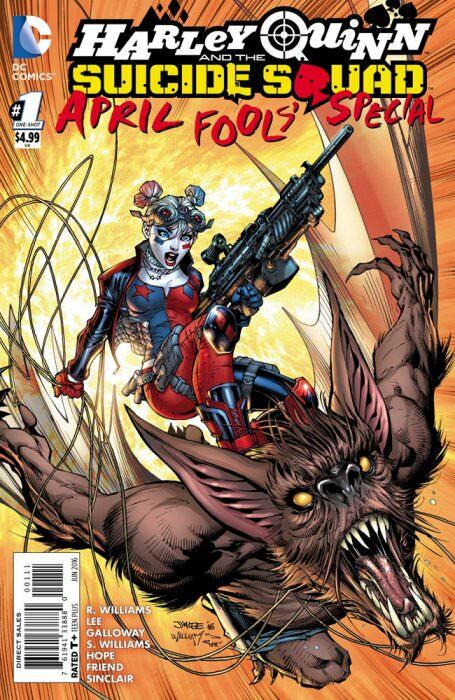 Although this story shows how Harley became a member of the Squad, it's definitely a solo Harley Quinn book. The story is actually pretty good. There's action, humor, and even a bit of sympathy for Harley Quinn when she realizes she's been duped and all she really wanted to do was go back to helping people like she did before she went bad. The art is a mixed bag. Jim Lee knocks it out of the park on his parts, but the middle section of the book is drawn in an extremely cartoony and childish way by Sean Galloway and it's a pretty abrupt change in look and tone. Overall, not a bad issue. Good story and mostly good art. I just want to know why the hell DC put out an April Fool's Day issue in June. A team of Soviet superheroes and a group of Soviet mutants both find themselves in conflict with government forces as the Soviet Union collapses and criminal elements within the government make a grab for power. It's a pretty simple story, but there's a LOT going on in this one shot. I have to admit that I wasn't familiar with ANY of these characters except for Crimson Dynamo, and there's a damn big cast in this book. 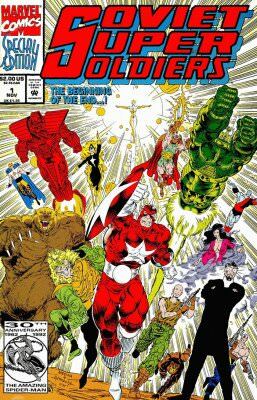 Mostly, the story revolves around a team of Soviet superheroes that are pretty much analogues of The Avengers. . .Crimson Dynamo being Iron Man, the shield-throwing Red Guardian being Captain America, there's a Thor counterpart, a Vision counterpart, a Scarlet Witch counterpart, etc. . . There's also a group of Soviet Mutants that are basically the X-Men, led by a Professor X copy and hounded from hiding place to hiding place by the government. Overall, the story is a bit of a hot mess because of the large amount of characters involved. The motivations of many of them are unclear and you really only know who they are and what their powers are because they shout out exposition in the middle of battle. The pencils and inking in this book are excellent! There is a large amount of detail crammed into every panel, and there are some truly impressive pages in this comic. Unfortunately, the colors are garish and extremely sloppy. . .in places to the point of distraction. It's a damn shame because it takes away from what is otherwise a VERY nicely drawn comic. Overall, this is a comic that is packed with too much story and too many characters, with great art marred by lousy coloring. 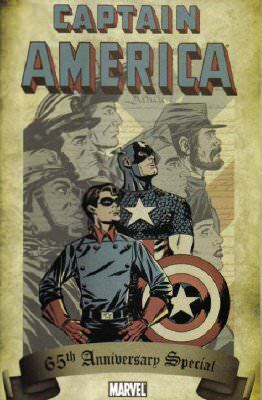 I found it interesting as a relic of the early 90's and the fall of the Soviet Union, and can appreciate that Marvel was trying to show us something a little different. . .unfortunately, with most of the characters being direct analogues of more popular Marvel characters, it wasn't really that different at all. Still, despite its flaws, I'd suggest this one for a read, if for curiosity value alone. Not too bad of a batch of one-shots. I'd have to say that Lobo was my favorite, with Captain America a close second. To me, Darkseid was the only REAL stinker in the bunch, but if you're a fan of Kirby's Fourth World stuff, you might like it a lot better than I did. Fantastic Four would probably be my second choice for the bottom of the pile. . .it's just way overstuffed with unrelated padding, but that's not to say it's BAD, just padded for price.